In our Drone Service Provider Business Guide, you’ll learn how to earn an income flying drones. Read it now. In this post, we’ll review the hardware you need to purchase when starting a drone business. We receive calls every day from drone pilots asking about the best drones and sensors for their specific applications. The answer to this question depends on several factors, including your budget and business objectives. In our last post, we discussed the various services you can offer to your clients, including applications in a range of industries. Your hardware requirements will vary depending on which services you select. For example, if you’re starting a drone business to provide aerial intelligence to farmers who own large properties, you’ll need a drone that can travel long distances (like the FireFLY6 PRO.) Also, to capture data that can be processed using a range of plant health algorithms, you’ll need a multispectral sensor. 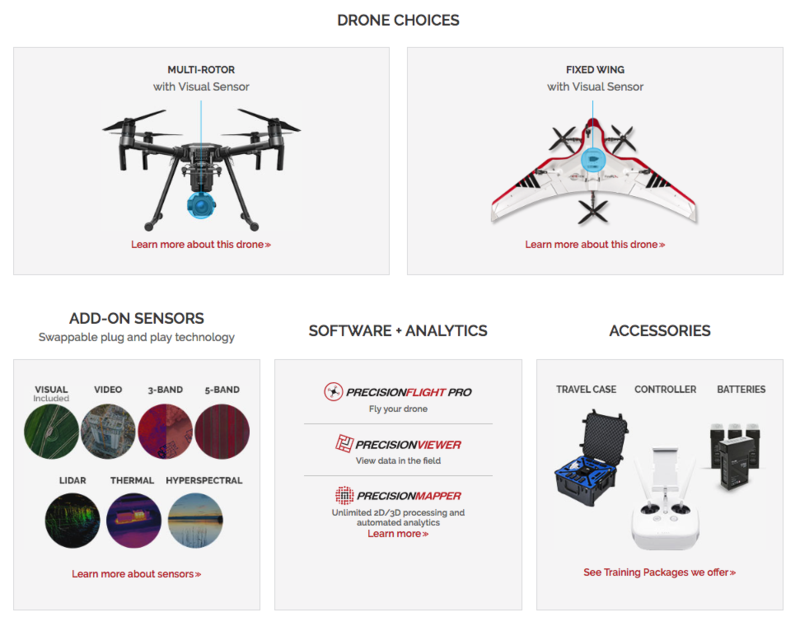 At PrecisionHawk, we created our Smarter packages to make it easy for you to procure all the tools you need to get started. We have packages designed for several industries, including insurance, energy, agriculture, construction and government. With our Smarter packages you’ll have the choice of a multi-rotor or fixed wing drone, either of which come with a visual sensor (advanced sensors optional). Our package also includes fundamental accessories, including a travel case, controller, and batteries. More information about our packages can be found here. LiDAR, hyperspectral, thermal, and other advanced sensors achieve unrivaled precision when deployed on drones. This accuracy is key to generating powerful maps and models which—when processed by machine intelligence—can identify plant disease, assess water quality, produce volume measurements, detect heat signatures, create surface composition surveys and more. Like choosing a drone, deciding which sensors to deploy often depends on your prospective clients’ needs, as well as your own business objectives and budget. In our eBook Beyond the Edge, you’ll learn about advanced drone-based sensing and four key sensors: thermal, multispectral, hyperspectral, and LiDAR. The book includes insight into how the sensors work and how to deploy them. Read it now. Any of these advanced sensors can be added to a PrecisionHawk Smarter Package. To learn everything you need to know about starting your own drone business, read our Drone Service Provider Business Guide. Or speak with one of our experts today.